While some pundits of old media often attack new media advocates for a lack of fact checking, aggregation of content and other non-traditional story gathering techniques they often ignore a culprit far more sinister, state run television. It’s within the ranks of state run networks that facts are not just left unchecked but changes to meet the needs of those in power and that’s what North Korean officials did this week during the funeral of Kim Jong Il. 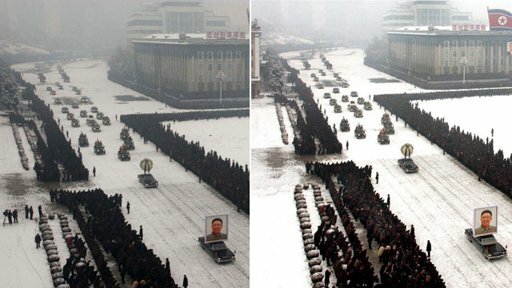 In the photo above you’ll notice a few changes, that’s because leaders in the country wanted Kim Jong Il’s funeral to be portrayed with military precision, something that required every observer to be in perfect alignment. To reach their goal anyone out of formation was replaced by snow on the left and right side of the photograph and a photoshop expert also appears to have lightened up the daytime sky to show a more “joyous” occasion rather than a dark and dingy snow filled atmosphere. The photoshop expert went so far as to remove the men standing behind the formation along with their camera and their foodprints. The photoshop job was verified by New York Times digital forensics expert Hany Farid of Dartmouth College. Question modern journalism all you want but new media has nothing on slanting news the way North Korean state run media does.